We had the priviledge of working along side Jean at the wedding of Derek and Noirin at Whitstable Castle on 22nd June 2013. Jean has an eye for detail and has lovely manner which puts all the guests at ease ensuring the best photographs. I am enclosing some photographs for you taken at Noirin and Derek’s wedding on 22nd June 2013. I hope these will be a reminder for you of a beautiful day which we were fortunate to share. May I take this opportunity to say how impressed I was at the excellent service you provided in your role as Toastmasters and you ensured the proceedings went smoothly and enabled the couple to relax and enjoy their day. On a personal level, your professional approach and assistance to me as the photographer was very much appreciated and you were so willing to help with gathering guests promptly for the photographs. Your organisational skills made my job so much easier and I’d like to think that our combined efforts and expertise resulted in some lovely memories for the Bride and Groom! Thank you once again and I hope we have the opportunity to work together again sometime and I would have no hesitation in recommending you for your services. Fran and Catherine organised a fantastic ladies night with fashion show and auction in the Museum of Quex Park. All proceeds were in aid of Breakthrough for breast cancer - Your Toastmasters are keen to support community and charity events. 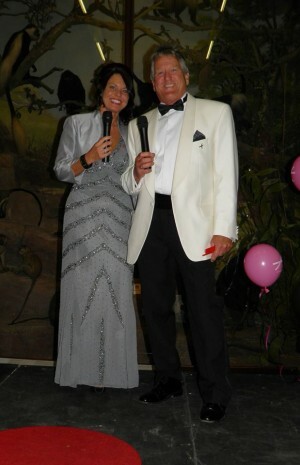 We are writing to thank you both for the wonderful job you did for us on Friday evening both with meeting and greeting guests and acting as our auctioneers for the Charity Fashion Show. What an amazing evening it was and we have had some great feedback. 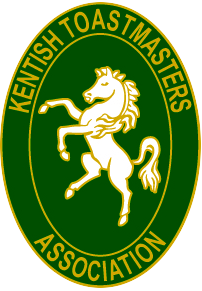 We are delighted to tell you that £1966.65 was raised on the evening. A lot of which, of course, came as a result of the auction – I am sure we would not have been able to raise as much without your encouragement Nikki – a huge WELL DONE! A press release has been sent out with photos and the Isle of Thanet Gazette has already picked up on it so that is a great for everyone involved. Once again thank you both for giving of your time and experience and hopefully we will be able to work together again in the future. Your Toastmasters were delighted to be toastmasters for Jackie and Chris for their wedding ceremony at St Mary's Church, Minster and Jamaican style wedding breakfast and reception at The Grove Ferry Pantry & Inn, Upstreet 25th May 2013. Just wanted to drop you a line to say a massive thank you to you both for helping to make our wedding so special - you were absolutely brilliant!!!! We had a fantastic honeymoon in Sri Lanka and really didn't want to come home! 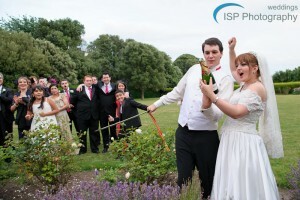 Attached is a link to a small selection of wedding photos that our photographer put together. He took nearly 900 photos in all and we don't know how we are going to select just a few for our wedding album. My son James and Lauren will be marrying sometime in the next year hopefully, so may be we will meet up again. Once again, thank you so much for everything you did. 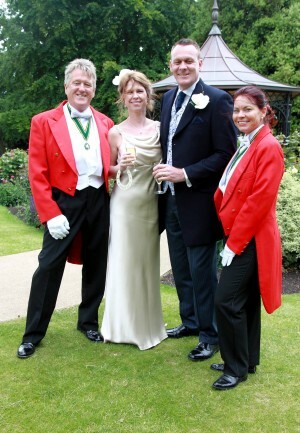 In my 40+ years as a dj I have worked with many toastmasters and rate Jonathan & Nikki as friendly, approachable, efficient, smart and totally reassuring. An exceptional team. 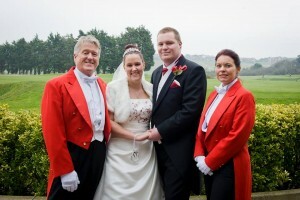 The wedding of Stephanie & Peter on 9th March 2013 was a first for Your Toastmasters! Stephanie from the ages of 5 - 11 was an ex pupil of both Nikki & Jonathan - we were delighted to have been part of her special day. Nikki and Jon and the service they provide made our day run so smoothly that we could enjoy our special day, without worrying about timings and if everything had been done or not. They also helped on a personal level by being my go to people, I lost my photographer and cars 3 months before the wedding and they were able to sort all this for me without me having to stress out about it, which I did very often lol. 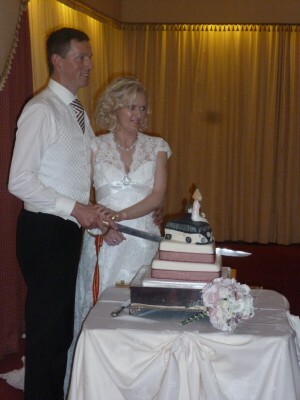 All of our guests were impressed by the sabrage we performed and we could cut the cake with a sword which was brilliant. I strongly recommend this service to anyone planning their special day as I couldn't have done it without them. We were delighted to have been toastmasters for Alun & Vicky at their wedding ceremony at Our Lady of the Sacred Heart, Herne Bay and wedding breakfast & reception at Sandwich Arts and Community Centre, Sandwich on 10th November 2012. So we are back from our honeymoon and back to reality!! Just wanted to get in touch with you both to say thank you so much!!! 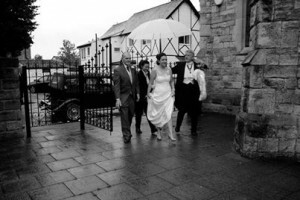 We loved the wedding, for us it was perfect, even the rain didn’t dampen the guests spirits and we thought everything went really well. Thank you so much for your hard work, honestly could not recommend you highly enough, you ensured it all went to plan and to make up on time lost from the bus disaster was amazing! We were very lucky to have lots of talented professional around us making sure it all come together! So many of our guests commented on you – saying how professional you were and helpful and just brought a really nice touch to the day, making sure everyone knew what was going on, bringing it all together. Now – where would you like me to write my declarations of love for you guys? Facebook or your website or somewhere else? Just let me know. Vicky also wrote on our facebook page: Hey John and Nikki, Alun and I can not thank you enough for your services on our wedding day 10.11.12 - we owe you guys a lot for the smooth running of the day!! eternally grateful! We have heard nothing but glowing reports from our guests too who said you were both amazing - professional as always, I can not recommend you enough!! Jason Short Organiser Charity cycle ride Lands End to Margate & fundraiser event for Margate Special Care Baby Unit 28th September 2012 at The Pavilion Broadstairs posted this on our facebook page. I would like to say a massive thankyou to Nikki and Jonathan. You stepped in at short notice and rescued me. Very organised and very professional at such a tough event. You really did help make the charity auction a huge success. You'll be top of the list for the next one. Huge thank you from all involved!!!! Many thanks for all your help and advice on our big day! Your assistance assured the whole day from start to finish went without a hitch! The kind helpful manner in which you guided us in the correct direction made it look almost choreographed, not to mention the opportunity to open a bottle of champagne with a saber! That was impressive and made an excellent photo opportunity and is still a talking point! The certificate of which hangs in the hall just to prove I am now qualified to perform said act! (The training of which was very easy and quite safe.) I would have no hesitation in recommending your services to anyone for any occasion which requires a certain touch of class! May we take this opportunity to wish you every success in the future. Again thank you. The happy couple Dean & Joanne. 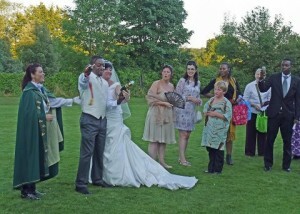 Your Toastmasters travelled to Addington Palace Croydon for the Nigerian English Wedding of Steven and Emma Arinze. We really enjoyed this colourful wedding for a special couple. Thank you so much for everything you did for us at the wedding. You made our day so special and stress free. As wedding toastmasters we have assisted at some beautiful weddings and the wedding of Paras & Patrick Campbell at St Peters Church and Courtstairs Manor on 28th July 2012 was no exception.